Crystal healing is an age-old healing tradition that works in conjunction with your own bodies’ natural energetic system. Different crystals work in different ways to help balance your chakras. If you have blockages or sluggish energy moving in your body, then this can result in disease. By removing the blockages and freeing the energies so that they once again flow freely through your body, you can enhance your wellbeing. When you are physically well, your emotional and spiritual wellbeing often follow. It is an exceptionally relaxing and pleasant experience often with powerful results. Everything in the universe vibrates to its own unique rhythm. Everything you see is made up of atoms that are uniquely vibrating right now. Every cell in your body is vibrating, as are crystals, rocks stones, gems, trees, etc. If you think it’s all hocus pocus, consider this – scientists have harnessed the power of the quartz and it is used today in watches, iPads, computers, etc. So, why can it not be used to heal the body directly? Clear quartz in particular has the ability to amplify and transmit subtle vibrations. Not only is it used in healing and development of psychic ability and it also helps to purify the air. Energy can attract or repel other energies. 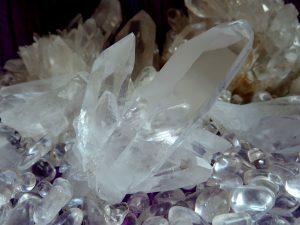 Using crystals in a healing practice uses energy in the same way. Crystals have the ability to transform and interrupt energies, which is how they heal with blocked energies in the body. Book your appointment now and feel better fast!